You can list products on WarriorPlus that are "subscription-based" meaning they have recurring payments (such as monthly, weekly, yearly). You may use either PayPal -OR- Stripe to sell subscription-based/recurring products on WarriorPlus. 2. Click on "Vendors" in the top menu. 3. Then click on "Products"
4. Click on the green button that says "+ New Product"
Note: If your membership/product/service has NO "expiration date" or "end date" you can leave it set to "No Limit" and buyers will continue to be billed until their subscription is canceled by either you or them. 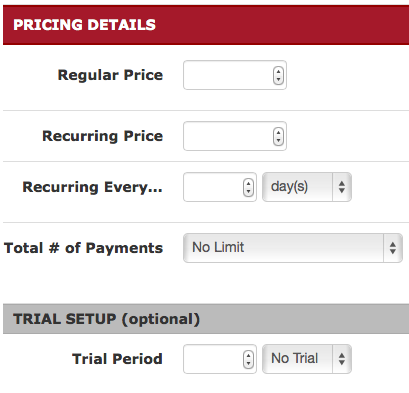 If you want to offer a "Trial Period" to your buyers, you can enter the number of days/months/years you wish to offer the trial for. Then select "days, months or years" from the dropdown menu and then a price text box will appear. Enter the price for the trial period and then it will automatically charge your buyers "$X" for the trial period that you set and then automatically change to the regular sales price after the trial period ends. When you're done editing your product, click SAVE and you're good to go!